2016 All-California Convention at Templars Hall, San Diego, California. Photograph by Judy Getrich. 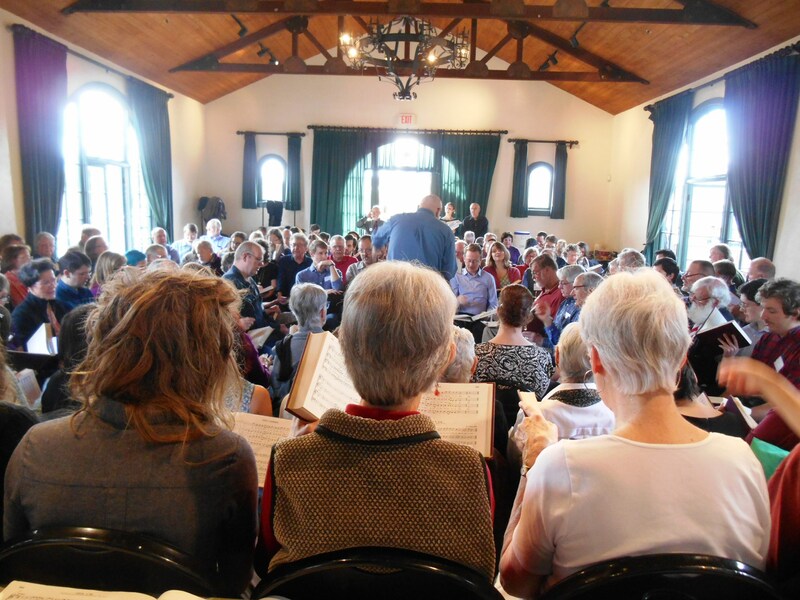 On the weekend of January 16–17, 2016, an enthusiastic crowd of singers gathered in Poway, California, for the 28th All-California Sacred Harp Singing Convention. Poway, known as the “City in the Country,” is centrally located in San Diego County. The All-California Convention rotates between the Los Angeles area, the San Francisco area, and the San Diego area, so it was last held in Poway in 2013. Singers from eighteen states, the United Kingdom, Germany, and Canada attended. 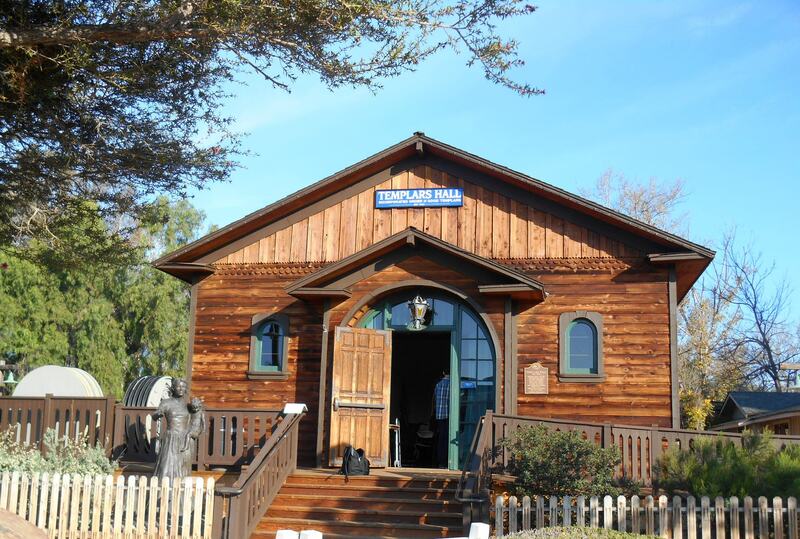 The San Diego singers offered a full weekend of events, starting with the Friday night activities, held in the Old Adobe Chapel, in the Old Town neighborhood of San Diego. This is a beautiful and intimate space, with great acoustics. The pews were rearranged for singing in the traditional hollow square. In addition to the electric lights, lit candles in sconces and candelabras added to the mood, creating a warm nostalgic feeling on a rare rainy night in San Diego. Next, the alternative singing from The Shenandoah Harmony started. With sixty to seventy people, the class filled the chapel with soaring song. The songs were new to many of us, but beautifully rendered. I thought this was a great reminder of how our shape-notes help with sight singing. There was a truly magical moment during a break. The electric lights in the chapel were turned off, so we could imagine attending a service lit only by candlelight. A call from the crowd started us on a haunting rendition of Idumea (p. 47b in The Sacred Harp) sung from memory. I know many of us were deeply touched by this spontaneous song. Templars Hall, San Diego, California. Photograph by Judy Getrich. Saturday morning we gathered at Templars Hall in Old Poway Park. This is another building with great acoustics. The beautiful hardwood floors, the floor-to-ceiling windows decorated with swags of hunter green, the vaulted ceilings, and the fresh air breezing through make it a wonderful singing space. Well over one hundred singers gathered to raise their voices in lovely harmony. The chair, Elaine Denny, opened the convention with the vice chair, Esteban Veliz, and the chaplain, David Fetcho, who led an opening prayer. Carla Smith and Elaine Denny. Photograph by Judy Getrich. 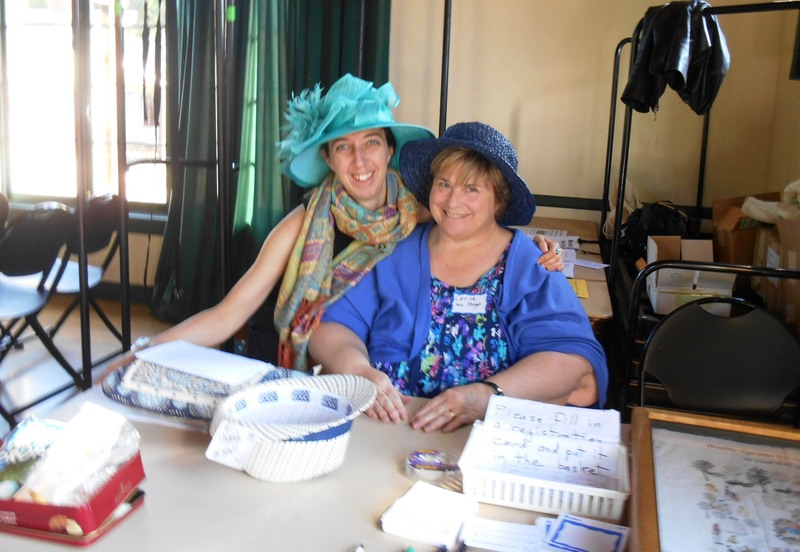 The members of the arranging committee, Judy Getrich and Carla Smith, kept the class going with a great balance of singing and visiting over the breaks. During the day, singers led ninety-six songs, as recorded by the secretaries, Mimi Wright and Judy Getrich. Dinner on the ground included so much food on the tables, no one could have gone hungry. Food for all—vegans, vegetarians, (well, this IS California!) 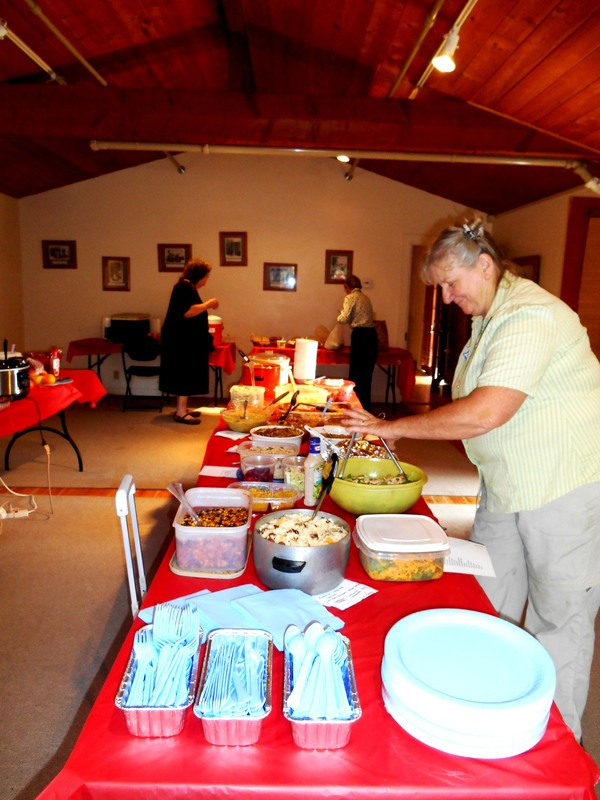 and as our chair, Elaine, put it, “people who eat meat.” And there were so many desserts, we didn’t just have a dessert table—there was a dessert ROOM. So many delicious contributions! Midge Harder fixing up the dinner table. Photograph by Judy Getrich. On Sunday, we gathered again to sing, and singers led ninety-five songs. The memorial lesson, given by Mike Hinton and Susan Cherones, included moving observations about those who could not join us. Mike’s remark that we find mention of memorial lessons in the oldest minutes of singings was a powerful reminder that what we sing has the weight of tradition behind it. Elaine made an impassioned speech about the wonderful Camp Fasola experience, and asked past participants to stand. I didn’t count, but there were probably dozens. She thanked David Ivey, the camp organizer, for doing so much to help keep our tradition alive and well, and encouraged everyone to attend if they can. Jerry Schreiber and Geoff Grainger of the resolutions committee helped to wrap up the day by recognizing so much of what went into hosting a wonderful singing and expressing thanks to all. And, although the singing ended, the events didn’t. Since this convention fell over a holiday weekend, many people could stay on Monday. Susan Willis-Powers led a wander through the tide pools of La Jolla, and Elaine Denny led a hike in the mountains. Speaking for the San Diego singers, I can say we delighted in creating a weekend of song and joy, and are so grateful for the many folks who traveled to spend time with us. And now, we’re all looking forward to next year’s All-California Sacred Harp Singing Convention, scheduled for the Los Angeles area. Come sing on the third Sunday and the Saturday before, which falls on January 14–15, 2017. Hope to see you there! Mairye Bates heard a radio story about Sacred Harp, and immediately fell in love with the harmonies and power. She's been singing alto with San Diego FaSoLa, across the country, and beyond, ever since. Her latest venture is a website with maps and reviews of cruise ship ports for walkers and runners.